For other uses of "M134", see M134 (disambiguation). The M134 Minigun is a 7.62×51mm NATO six-barrel rotary machine gun with a high, sustained rate of fire (2,000 to 6,000 rounds per minute). It features a Gatling-style rotating barrel assembly with an external power source, normally an electric motor. The "Mini" in the name is in comparison to larger-caliber designs that use a rotary barrel design, such as General Electric's earlier 20 mm M61 Vulcan, and "gun" for the use of rifle caliber bullets as opposed to autocannon shells. "Minigun" refers to a specific model of weapon that General Electric originally produced, but the term "minigun" has popularly come to refer to any externally powered rotary gun of rifle caliber. The term is sometimes used loosely to refer to guns of similar rates of fire and configuration, regardless of power source and caliber. The ancestor to the modern minigun was a hand cranked mechanical device invented in the 1860s by Richard Jordan Gatling. Gatling later replaced the hand-cranked mechanism of a rifle-caliber Gatling gun with an electric motor, a relatively new invention at the time. Even after Gatling slowed down the mechanism, the new electric-powered Gatling gun had a theoretical rate of fire of 3,000 rounds per minute, roughly three times the rate of a typical modern, single-barreled machine gun. Gatling's electric-powered design received U.S. Patent #502,185 on July 25, 1893. Despite Gatling's improvements, the Gatling gun fell into disuse after cheaper, lighter-weight, recoil and gas operated machine guns were invented; Gatling himself went bankrupt for a period. During World War I, several German companies were working on externally powered guns for use in aircraft. Of those, the best-known today is perhaps the Fokker-Leimberger, an externally powered 12-barrel rotary gun using the 7.92×57mm Mauser round; it was claimed to be capable of firing over 7,000 rpm, but suffered from frequent cartridge-case ruptures due to its "nutcracker", rotary split-breech design, which is fairly different from that of conventional rotary gun designs. None of these German guns went into production during the war, although a competing Siemens prototype (possibly using a different action), which was tried on the Western Front, scored a victory in aerial combat. The British also experimented with this type of split-breech during the 1950s, but they were also unsuccessful. In the 1960s, the United States Armed Forces began exploring modern variants of the electric-powered, rotating barrel Gatling-style weapons for use in the Vietnam War. American forces in the Vietnam War, which used helicopters as one of the primary means of transporting soldiers and equipment through the dense jungle, found that the thin-skinned helicopters were very vulnerable to small arms fire and rocket-propelled grenade (RPG) attacks when they slowed down to land. Although helicopters had mounted single-barrel machine guns, using them to repel attackers hidden in the dense jungle foliage often led to overheated barrels or cartridge jams. In order to develop a more reliable weapon with a higher rate of fire, General Electric designers scaled down the rotary-barrel 20 mm M61 Vulcan cannon for 7.62×51mm NATO ammunition. The resulting weapon, designated M134 and known popularly as the Minigun, could fire up to 6,000 rounds per minute without overheating. The gun has a variable (i.e. selectable) rate of fire, specified to fire at rates of up to 6,000 rpm with most applications set at rates between 3.000-4,000 rounds per minute. View of M134 from inside Huey, Nha Trang AB, 1967. The Minigun was mounted on Hughes OH-6 Cayuse and Bell OH-58 Kiowa side pods; in the turret and on pylon pods of Bell AH-1 Cobra attack helicopters; and on door, pylon and pod mounts on Bell UH-1 Iroquois transport helicopters. Several larger aircraft were outfitted with miniguns specifically for close air support: the Cessna A-37 Dragonfly with an internal gun and with pods on wing hardpoints; and the Douglas A-1 Skyraider, also with pods on wing hardpoints. Other famous gunship airplanes are the Douglas AC-47 Spooky, the Fairchild AC-119, and the Lockheed AC-130. The U.S. government had procured some 10,000 Miniguns during the Vietnam War. Around 1990, Dillon Aero acquired a large number of Miniguns and spares from "a foreign user". The guns kept failing to shoot continuously, revealing that they were actually worn-out weapons. The company decided to fix the problems encountered, rather than simply putting the guns into storage. Fixing failure problems ended up improving the Minigun's overall design. 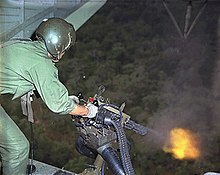 Dillon's efforts to improve the Minigun reached the 160th SOAR, and the company was invited to Fort Campbell, Kentucky to demonstrate its products. A delinker, used to separate cartridges from ammunition belts and feed them into the gun housing, and other parts were tested on Campbell's ranges. The 160th SOAR were impressed by the delinker's performance and began ordering them by 1997. This prompted Dillon to improve other design aspects including the bolt, housing and barrel. Between 1997 and 2001, Dillon Aero was producing 25–30 products a year. In 2001, it was working on a new bolt design that increased performance and service life. By 2002, virtually every component of the minigun had been improved, so Dillon began producing complete weapons with improved components. The guns were purchased quickly by the 160th SOAR as its standardized weapon system. The gun then went through the Army's formal procurement system approval process and in 2003 the Dillon Aero minigun was certified and designated M134D. Once the Dillon Aero system was approved for general military service, Dillon Aero GAU-17s entered Marine Corps service and were well received in replacing the GE GAU-17s serving on Marine UH-1s. The core of the M134D was a steel housing and rotor. To focus on weight reduction, a titanium housing and rotor were introduced, creating the M134D-T which had reduced weight from 62 lb (28 kg) to 41 lb (19 kg). The gun housing had a 500,000 round lifespan before it wore out, which was far higher than a conventional machine gun's 40,000-round lifespan but lower than that of other rotary guns. A hybrid of the two weapons resulted in the M134D-H, which had a steel housing and titanium rotor. It was cheaper with the steel component and only 1 lb (0.45 kg) heavier than the M134D-T, and restored its lifespan to 1.5 million rounds. The M134D-H is currently in use on various 160th Regiment platforms. Dillon also created specialized mounts and ammunition-handling systems. Initially, mounts were made only for aviation systems. Then from 2003 to 2005, the Navy began mounting Dillon miniguns on specialized small boats. In 2005, the Naval Surface Warfare Center Crane Division procured guns to mount on Humvees. In Iraq, US Army Special Forces units on the ground were frequently engaged by opposition forces, so they mounted M134D miniguns on their vehicles for additional firepower. After several engagements the attackers seemed to avoid vehicles with miniguns. Later, the Special Forces units began concealing their weapons so opposition troops would not know they were facing the weapon; the regular Army units did the opposite, creating minigun mock-ups out of painted PVC pipes tied together to resemble barrels to intimidate enemies. The basic minigun is a six-barrel, air-cooled, and electrically driven rotary machine gun. The electric drive rotates the weapon within its housing, with a rotating firing pin assembly and rotary chamber. The minigun's multi-barrel design helps prevent overheating, but also serves other functions. Multiple barrels allow for a greater capacity for a high firing rate, since the serial process of firing, extraction, and loading is taking place in all barrels simultaneously. Thus, as one barrel fires, two others are in different stages of shell extraction and another three are being loaded. The minigun is composed of multiple closed-bolt rifle barrels arranged in a circular housing. The barrels are rotated by an external power source, usually electric, pneumatic, or hydraulic. Other rotating-barrel cannons are powered by the gas pressure or recoil energy of fired cartridges. A gas-operated variant, designated XM133, was also developed. While the weapon can feed from linked ammunition, it requires a delinking feeder to strip the links as the rounds are fed into the chambers. The original feeder unit was designated MAU-56/A, but has since been replaced by an improved MAU-201/A unit. 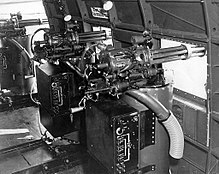 Various iterations of the minigun have also been used in a number of armament subsystems for helicopters, with most of these subsystems being created by the United States. The first systems utilized the weapon in a forward firing role for a variety of helicopters, some of the most prominent examples being the M21 armament subsystem for the UH-1 and the M27 for the OH-6. It also formed the primary turret-mounted armament for a number of members of the Bell AH-1 Cobra family. 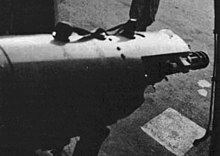 The weapon was also used as a pintle-mounted door gun on a wide variety of transport helicopters, a role it continues to fulfill today. A distinctive invention of fiction is the hand-held M134 minigun (often with a chainsaw-style grip), a concept which was popularized by the 1980s-90s films Predator and Terminator 2: Judgment Day, wielded by Jesse Ventura/Bill Duke and Arnold Schwarzenegger respectively, and decades later still appears in video games and films such as Captain America: The Winter Soldier, the Grand Theft Auto series, and Furious 7 (the latter in which it is fired by Dwayne Johnson). The chainsaw-style grip layout has also been carried over to single-barrel machine guns. For movie use, armorers slow down the M134 minigun's rate of fire to conserve ammo, and to allow the spinning barrels to be visible to the movie audience, with a hidden power cable for the firing scenes, and using blank ammo to ease recoil. Nonetheless the prop is still extremely physically demanding, hence the actors wielding it are physically imposing and often have bodybuilding backgrounds. Generally, such depictions will totally ignore the weapon's need for external power, and sometimes even forget that it requires a source of ammunition. 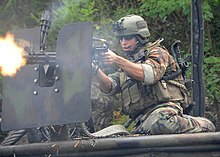 In practice, a man-portable M134 minigun would be nearly impossible to manage as an individual infantry weapon, and highly impractical for a human being to either carry or operate. A scaled-down version of the M134, the XM214 Microgun, never reached production status for such reasons. ^ "M134 Minigun fun in Afghanistan". 30 March 2014 – via YouTube. ^ "U.S. Patent 502185 Gatling Gun". Retrieved February 4, 2010. ^ Chivers, C. J. (2010). The Gun. Simon & Schuster. pp. 116–119. ISBN 978-1-4391-9653-3. ^ a b Weyl, A. R. (8 March 1957). "Motor-guns—a Flashback to 1914-18". Flight. 71 (2511): 313–314. Retrieved 30 September 2015. ^ Williams, Anthony G. (8 November 2005). "Split Breech Guns: The Nutcracker and the 40mm Mk 18". Archived from the original on 14 June 2007. ^ Williams, Anthony G.; Gustin, Emmanuel (2005). Flying Guns of the Modern Era. Crowood. p. 55. ISBN 978-1-86126-655-2. ^ "General Electric M134 Minigun Six-Barrel Gatling Gun". ^ a b c Jarvis, John Paul. "Brought to You By GE: The M134 Minigun". ^ a b c d e Gourley, Scott W. (30 May 2013). "The Evolution of the M134D Minigun". Defense Media Network. Retrieved 5 February 2015. ^ "Hybrid M134D-H: M134 Gun Systems". Dillon Aero. Retrieved 30 September 2015. ^ a b "Garwood Industries M134G Minigun". The Bang Switch. 7 June 2013. Retrieved 30 September 2015. ^ "M134G Gun Control Unit". Garwood Industries. Retrieved 30 September 2015. ^ United States, 1969. p. B-2. ^ United States, 1969. p. C-31. ^ "Standard M134D". Dillon Aero. 2015. Retrieved 30 September 2015. ^ "Garwood Industries M134G Minigun". Garwood Industries. 2013. Retrieved 30 September 2015. ^ Gunston, 1988. pp. 188–9. ^ "U.S. Army Helicopter Weapons". U.S. Army TACOM-RI. 24 February 2006. Archived from the original on 4 February 2008. Retrieved 8 January 2008. ^ a b Friedman, Norman (2006). The Naval Institute Guide to World Naval Weapon Systems. Naval Institute Press. p. 491. ISBN 9781557502629. ^ DiGiulian, Tony (30 October 2006). "USA 0.30 caliber (7.62 mm) Minigun". NavWeaps.com. Retrieved 3 April 2008. ^ Parsch, Andreas (23 June 2006). "Designations Of U.S. Aeronautical and Support Equipment". Designation-Systems.net. Retrieved 3 April 2008. ^ "You Call That High Capacity?". Thefirearmblog.com. 11 September 2013. ^ "RAL 7013 - Bell OH-58B Kiowa". doppeladler.com (in German). Retrieved 30 September 2015. ^ Kammonen, Teemu (3 August 2012). "Puolustusvoimien uusi ase: M134D "Minigun"". Uusi Suomi (in Finnish). Retrieved 30 September 2015. ^ "Armament of the Georgian Army". geo-army.ge. Archived from the original on 9 March 2012. Retrieved 30 September 2015. ^ "En Enero el Ejercito Mexicano recibira 400 full Kits M-134 minigun para Hummvees y Cheyenne" (in Spanish). Todopormexico.foroactivo.com.mx. 21 December 2010. Retrieved 20 January 2012. ^ "Perú inspecciona las ametralladoras M-134D adquiridas a Dillon Aero". Infodefensa.com (in Spanish). 25 April 2014. Retrieved 30 September 2015. ^ "Miniguny w końcu kupione". Altair Agencja Lotnicza (in Polish). 11 January 2013. Retrieved 30 September 2015. ^ "Der kleine Giftzwerg kann auch anders". Luftwaffe (German Air Force) (in German). 11 April 2018. Retrieved 1 August 2018. ^ a b "Terry and the Minigun (TV Episode 2017)". Hollywood Weapons: Fact or Fiction?. ^ North, Rockstar. "Rockstar Games Social Club". socialclub.rockstargames.com.